The crew is shown leaving the Crew Compartment Trainer. In this historical photo from the U.S. space agency, STS-93 crew emergency egress training in the Crew Compartment Trainer (CCT) on July 30, 1998. 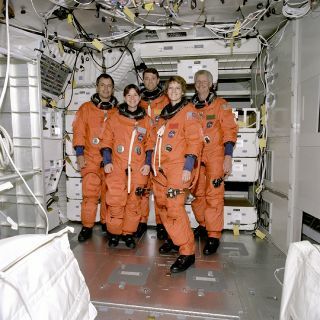 The five crewmembers of STS-93 in the middeck mock-up are from left to right: Mission Specialist Michel Tognini, Mission Specialist Catherine "Cady" Coleman, Pilot Jeffrey Ashby, Commander Eileen Collins and Mission Specialist Stephen Hawley.